As soon as the Zlins attacked, the SLAF looked for an air-to-air interceptor. “It was an urgent requirement” the current Chief of the Air Staff, Air Marshal Roshan Goonetileke told me: “In a strange way it taught us a lesson we probably deserved and we bought four double-delta winged F-7GS equipped with a Chinese-built air radar and armed with Chinese airto-air missiles. They joined 5 Sqn at Katunayake. While the F-7BS continues to serve the unit, it is now mainly in a training role, preparing fighter pilots for the F-7GS, Kfir or MiG-27. The squadron currently has six pilots, three were trained at Chengdu and the other three came from SLAF aircraft (K-8, Kfir and MiG-27). Four of these improved F-7s have brought the SLAF’s air defence capabilities up to a new level, when worked in conjunction with 2d radars that are being installed by the Indian Air Force. No 5 Sqn is the SLAF’s only interceptor squadron and its F-7GS armed with two PL-5E air-to-air missiles, stands on a 24-hour alert. Since being introduced into service in January 2008, 5 Sqn pilots have been called into action several times. 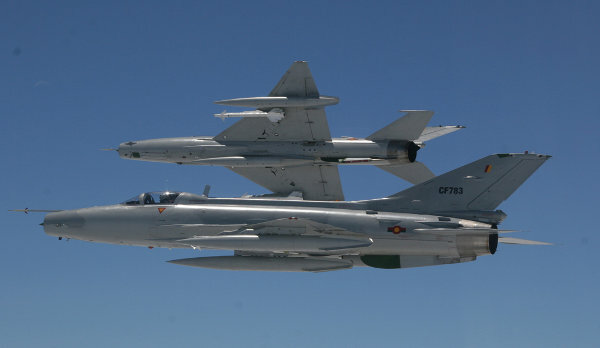 The CO of 5 Sqn told me of several F-7GS’ interceptions that had taken place over the past few months: “In early September 2008, two Zlin 43s flown by the Tamil Tigers’ Air Tigers were picked up in the north coming from Iranamadu heading west towards Manna, where they bombed an army post. While one of them flew back to its airstrip, the other flying low started heading south. Our radars picked it up at 22.22 and we were scrambled to intercept the aircraft. It was a dangerous mission, not just for the two Tamil Tiger Air Wings pilots, but for the F-7GS pilots, who had to fly their aircraft at very low level in the dark looking for the enemy, without the aid of night vision goggles. The CO continues: “On September 9, 2008 a Zlin 143 dropped a bomb on SLAF Base Vavuniya while the base was under attack from mortars and rockets. One of our jets was scrambled to intercept the aircraft. When it turned back it went down very low and our ground radars lost him, but the F-7GS pilot still had him on his radar. He was tracked back to the west of Malaitivu where the Chinese PL-5E air-toair missile was fired, some 1,650 feet (500 metres) away from the Zlin 143. There was an almighty explosion and that was all the pilot could say about the destruction. Chengdu F-7 Airguard, 5th Squadron, Sri Lanka Air Force. Жирохов, Михаил Александрович: Райский уголок в огне, in Крылья Родины, № 9-10, 2016. Chengdu Jian-7, Wikipedia, The free encyclopedia, http://en.wikipedia.org/wiki/F-7_Skybolt. Security Forces crush major terror attack at Vavuniya; 10 LTTE bodies found, Ministry of Defence - Sri Lanka, http://defence.lk/new.asp?fname=20080909_02. Sri Lanka Air Force, http://www.airforce.lk/. Sri Lanka Air Force F-7 fighter shot one Tiger aircraft down, China Military Power Mashup http://www.china-defense-mashup.com/?p=663. Zlín Z 43, Wikipedia, the free encyclopedia http://en.wikipedia.org/wiki/Zlín_Z_43.